5004 14:07:43 ERROR MongoDbDictionary.Store() has failed. Create a folder with the path C:\data\db. This is the built in default location that MongoDB uses to store database files, but the can be changed if desired. Congratulations, you are now running MongoDB! Choose a location and name for your MongoDB log file. Let's put ours in c:\data\mongolog.txt. Go to your Local Services, and you should find a new called MongoDB. It will be set to Automatic, so will start on the next reboot. Click Start to get it running. You can check the log file to confirm it is running. Note you can specify a number of options when creating the service, such as --dbpath to specify where you want databases to be stored, or --port to change from the MongoDB default of 28017. You can also define a configuration file, so that you can change options without having to recreate the service, using the --config option. The MongoDB configuration format is described here. you would see two new files, "mynewdb.0" and "mynewdb.ns", to store data and indexes. It's interesting to compare this to the syntax to create a database in SQL Server, which requires specifying a location for the data and log files when you issue the command. With MongoDB, this configuration is owned by the MongoDB instance, so that from the application's point of view, MongoDB database creation is frictionless. 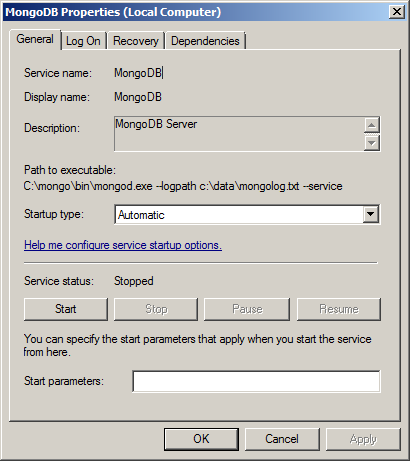 (I was struck by this when I enabled the MongoDB session state provider with Sitecore 7.5. All I had to do was make the configuration change and add a connection string, and the Sitecore application created the database and schema on its own.) In a similar way, we created a collection (roughly equivalent to a "table" in SQL) simply by referring to it. Let's go take another look at the insert command. You'll notice that the thing being inserted was a JSON document. MongoDB stores JSON documents (hence the name "document database"), and does not impose any rules on how they are structured. You can view it as a place to park JSON, but one with really powerful querying and indexing capabilities. Arrays are treated like tags, so if you specify an array element, then all documents that have that array element will match. You can use "dot notation" to specify subdocuments. You can use regular expressions, which are especially efficient if an index is in place on the field and the expression is specified to match strings beginning with a pattern ("prefix query"). Note the number of BinData values. This is how MongoDB represents GUIDs. I will come back to how you can translate these into .NET Guids in the next section. Sitecore uses a number of subdocuments. For example, the Browser is stored as a subdocument, so you can query for sessions using Chrome with "Browser.MajorName", or a specific version with "Browser.BrowserVersion." Pages are stored in a nested array, and page events are stored as a nested array within Pages. This nesting of object hierarchies is typical of how MongoDB stores data, and avoids the performance hit of doing table seeks that are required when joining tables. In DMS, this data would be stored in five tables: Visitors, Visits, Pages, PageEvents, and PageEventDefinitions. Session data is written to MongoDB when the SessionEnd event is fired. We can see amusing proof of this in the fact that the page event captured is the exception I referred to at the beginning of this post. Obviously, the error that MongoDB is unavailable must have been persisted in memory until MongoDB became available. You can work around this while doing development by recycling your app pool, or wiring up a button to call Session.Abandon() to end the ASP.NET session. The xDB Overview and Architecture document states: "In the xDB, currently the only type of interaction is an online visit but in the future this will be expanded to include offline interactions." We can see this provided for in the field "_t", set to "VisitData". This refers the Sitecore analytics class (Sitecore.Analytics.Model.VisitData) that has been serialized into this document. By specifying the type, Sitecore provides for storing other sorts of interactions in this collection. This will allow doing things like aggregating engagement value (in the "Value" field) across multiple interaction types, seeing for example whether web, in store, or telephone contacts are generating the most engagement value. Here we see how MongoDB's lack of defined schema is used to allow storing a variety of classes that share the same base class, allowing for querying at either a base or subclass level. This sort of open-ended design, allowing for future evolution of the product without requiring schema changes, shows why MongoDB was a compelling choice as a foundational technology for the xDB. Thanks for a great post, I got MongoDB up and running because of it. In your Sitecore data example, you show a page visit where Pages.PageEvents.Data is "Database not available" and URL.Path is "/" (root). This entry is also found in my database, even though I have now visited my page many times on many different URLs. It seems like an error. Is anything missing? Do I need to do something else to be able to track page visits correctly? If you are seeing only one occurrence (or a small number that does not increase), then you are fine. You are just seeing records created before MongoDB was wired up. Hi Dan. The count is 1 using that query. But if I do db.Interactions.count(), I also get 1, so it seems that it is the only row in the database. I have checked that the connection is correct in ConnectionStrings.config and that analytics is enabled in Sitecore.Analytics.config (it also seems to be configured correctly, as the analytics database is in fact present in MongoDB). This is not an issue. You are seeing the record that got created when you got started. It won't go away unless you delete it, but there is no reason to do so. Just noticed that you said this was the only row in your DB. I would try adding a few different content items, and then end your session. I believe you can do this by recycling the app pool and hitting the web site, or you can call Session.Abandon(). Sitecore does not write to MongoDB until the session ends. It didn't help recycling the app pool, but stopping and starting the app pool did! Now, my page visits are logged in the database. Thank you for helping out. Great post! Great explanation, why MongoDB is the choice for the Sitecore analytics data and why SQL server is not. This is great information. Especially converting the GUID data. Is there any chance you can show us how to decode the IP data as well?